“Middle Keys” describes the 16-mile stretch of islands from Conch Key and Coral Key at MM63 to the southernmost tip of Marathon at MM47. Other islands within the Middle Keys include Duck Key, Grassy Key, Crawl Key, Coco Plum, and Key Colony. Marathon is the hub of the Middle Keys, so people will many times refer to the Middle Keys as “Marathon.” The southern boundary of the Middle Keys is the center point of the Seven Mile Bridge. 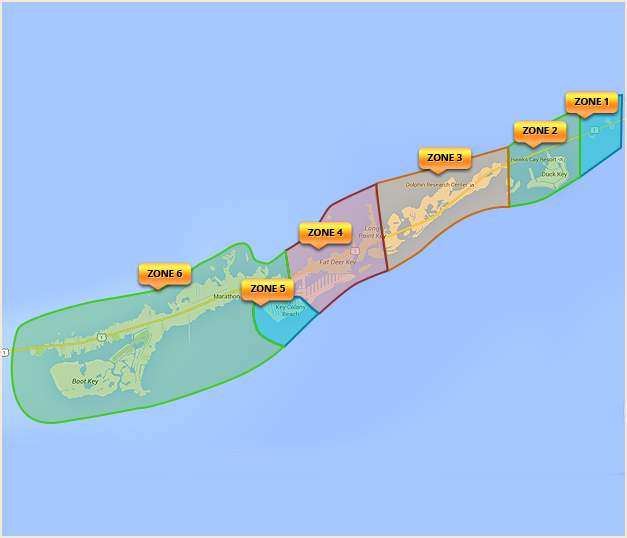 Conveniences in the Middle Keys include Florida Keys Marathon Airport, HomeDepot, K-Mart, Fishermen’s Hospital, West Marine, Publix, and Winn-Dixie. If fewer tourists and a quiet hometown mainland feel are appealing to you, then the Middle Keys may be just right for you. If the Middle Keys is where you feel most comfortable, you need to narrow your search to a specific Zone, or key, within the Middle Keys. Some prefer Key Colony, while others prefer a section of Marathon, or Coco Plum. Your search begins here at WaterfrontAuthority.com. Your next step is to contact TraeZipperer and arrange a day and time to meet in the Keys. Once in the Keys with an experienced waterfront real estate broker to guide you, you’ll be able to select the best property and become an owner in this tropical paradise with gin clear water and water sports second to none.